Home > Posts tagged "PoliMigra"
I have lived in Collier County (southwest coast of Florida) for 18 years, and I grew up living with fear of our own police department. But things are much worse now than they have ever been because of the poli-migra effect. What is the poli-migra effect? In 2007, our local law enforcement signed a collaboration agreement with ICE, called 287(g). It gives police the power to act as immigration officers, which has led to putting up checkpoints in Latino areas like Immokalee; harassing community members who don’t have documents; and detaining immigrants at our local jail for months at a time, only for being undocumented, even though they should be low-priority. My community is so tired of being terrorized by the poli-migra, that in the last 6 months we have stepped up to call for an end to police-ICE collaborations. The moment has finally come to end this once and for all, and we need your help! The 287(g) agreements expire in January 2013, and our friends at the ACLU of Florida created a petition asking Senators Bill Nelson and Marco Rubio to allow them to expire and not expand any further. Read and sign the petition now. My county is not the only one in Florida with poli-migra; there are three total. If we let these agreements be renewed, or even expand to other counties, they will turn Florida into a copy of Arizona, county by county. We need our local police to really concentrate on our public safety, not harassing our communities or separating families. All our signatures will be sent to Senators Nelson and Rubio with a letter signed by several organizations in Florida. If you are part of an organization that would like to sign-on, click here to download the letter to print and send me your name, organization and location to grey@floridaimmigrant.org no later than this Friday, December 7th at 9 a.m.
FLIC y la ACLU te invitan a participar en nuestro Encuentro sobre Poli-Migra en Orlando, FL, el Sábado, 23 de junio. Desde hace varios años estamos enfrentando con la aplicación de leyes migratorias por agentes de inmigración y la policía local en nuestras comunidades, lo cual ha conducido a un aumento en la discriminación racial por parte de la policía, redadas, detenciones y deportaciones. El objetivo de este Encuentro es entender estos temas que nos afectan y definir estrategias conjuntas que nos permitan protegernos. están comprometidos a comprometido a continuar el trabajo en sus regiones locales después de la cumbre. Valor: Estamos pidiendo a todos los participantes que contribuyan $10 para cubrir los costos del Encuentro y el almuerzo. Puedes solicitar una beca o recibir incentivos para transporte una vez te registres. Además, puedes patrocinar a un amigo para ayudar a aquellos que no pueden asumir los costos de participar en el Encuentro. Immigration Enforcement Summit in Florida! 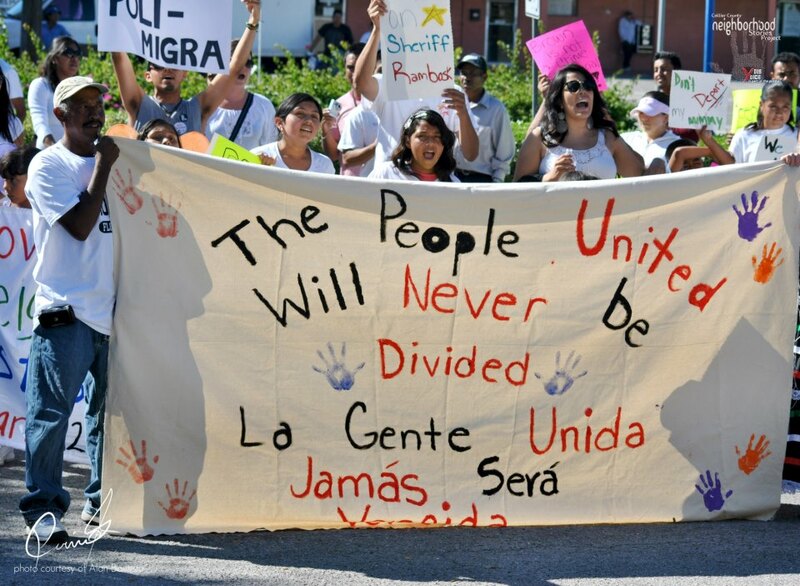 For several years now, we have been dealing with increased immigration enforcement in our communities leading to racial profiling by police, raids, detentions and deportations. The goal of the summit is to understand these issues that are affecting us and strategize together on how to protect our communities statewide. are committed to continuing the work in their local regions after the summit. Cost: All participants are asked to contribute $10 to cover the costs of the summit and their lunch.